Prep our Easy Parmesan Chicken Recipe in 10 minutes. With the great taste of this Parmesan chicken recipe, you won't believe how few ingredients you need. 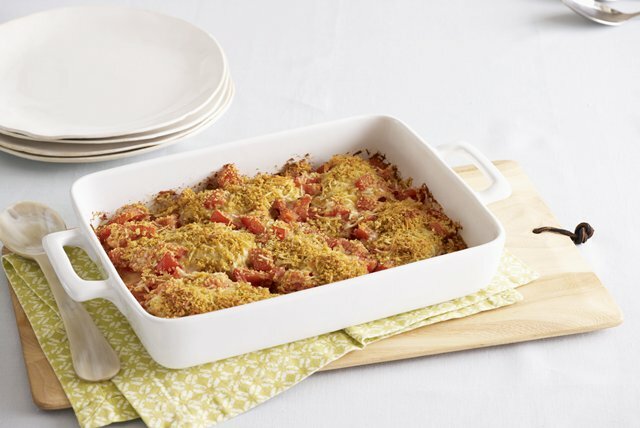 Combine bread crumbs and cheeses; sprinkle 1/2 cup onto bottom of 13x9-inch baking dish sprayed with cooking spray. Top with chicken. Spoon tomatoes around chicken; sprinkle with remaining cheese mixture. Bake 30 to 32 min. or until chicken is done (165ºF). We really love this recipe which was originally developed using our recently discontinued FRESH TAKE Cheese Bread Crumb Mix. We revised it to use KRAFT Shredded and Seasoned Grated Parmesan Cheeses and panko bread crumbs. Give it a try!